When I saw the weather forecast for the week beginning 1st February, I thought a trip to the Lake District would be a good idea. 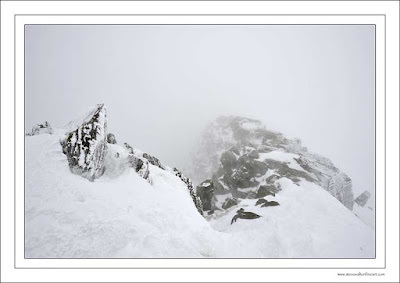 I wanted some winter shots of Striding Edge and Helvellyn. Heavy snowfall was forecast for parts of the UK during the week. As it happened, I left some of the heaviest snow behind in the Midlands. The South West also saw a lot of snow and, as usual, the country ground to a halt as he effects of the weather took hold. I took the motorhome and parked overnight by Ullswater. It snowed during the night and I decided to move to Glenridding on Monday. The inevitable happened and I was snowbound in the carpark at Glenridding for a couple of days, which is exactly what I intended to happen! The snowfall began to back off about 10am, so I loaded my rucksack with a Nikon D3 and 14-24 f2.8 lens and the Fuji 617 with 90mm swa, tripod, film and lightmeter. Quite a hefty load, both cameras and lenses are substantial chunks of gear. The Berghaus Extreme Climb has been a brilliant sac for carrying cameras and assorted equipment. I'm convinced Berghaus litres are greater than normal litres, this is supposed to be a 35ltr sac, but it seems to swallow big loads without problems. All went well until I got to a steep section that leads up the flank of Birks to Hole in the Wall. The snow suddenly became hard-packed and icy. Time to strap the crampons on! By the time I reached Hole in the Wall, there was a moderate wind on my back and I was being blasted by spindrift. Visibility dropped to about 12 metres and this gave me a good indication of what I could expect on Striding Edge. I wasn't wrong. When I got to the top of Low Spying How, the wind was so strong that it was impossible to stand upright during the strongest gusts. Visibility dropped to what seemed like zero! The temperature fell dramatically because of the windchill. I have no idea how low it went, but my water bottle had frozen solid in my rucksack. Taking gloves or mountain cap or hood off were not an option. As I made my way carefully along the ridge, the day became a whiteout. I stopped briefly to take a record shot of the conditions on the ridge with the D3. The camera went white and iced over almost instantly. Although it was working fine, I didn't want to risk damage to the Nikon, so I put it away again. It stayed in my rucksack for the rest of the day. There's not a lot more to say about the walk because I had to focus carefully on negotiating the ridge and then navigating my way through the whiteout to get safely off Helvellyn and back down to Glenridding. It was dark when I got back to the van. All that effort for one record shot!